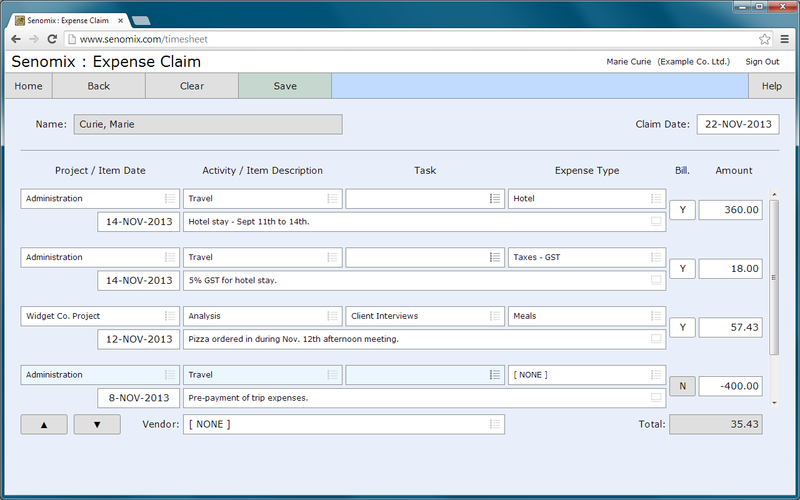 Would you like to eliminate the hassle of paper-based expense claims? 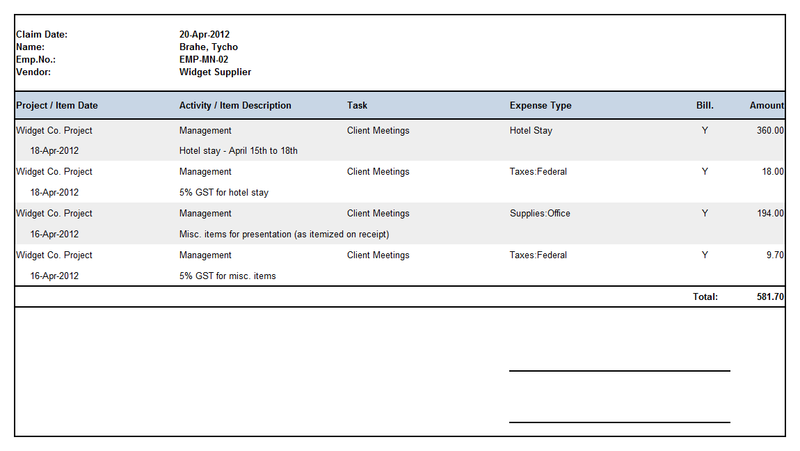 With Senomix Timesheets, you can record and track your expenses with the same system used to track your office time. 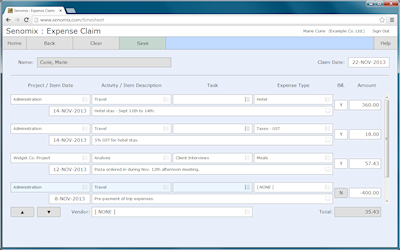 Providing a simple form which allow the entry of expenses with the same project, activity and task items used for your time billing, the expense entry screen of Senomix Timesheets lets your staff quickly record receipts and return to their work. As with your office timesheets, an employee only needs to enter their expense items, click 'save', and they're done, with all information immediately available for review on your office's central server. Whether recording mileage, taxes, meals, or purchased goods, the expense tracking facility of Senomix Timesheets allows you to quickly identify the exact amounts paid for support of your work, while providing your staff with a convenient means of submitting their claims for reimbursement. Allowing you to designate expenses as billable or non-billable, Senomix Timesheets also lets you create whichever expense types you would like to help categorize your recorded amounts. Printable claims can also be created right from an employee's desktop if a physical copy is needed for signature, or as a convenient page to attach receipts for filing. Just like your office time, expenses can also be exported to QuickBooks or your corporate database, allowing you to direct expense data to your accounting software. 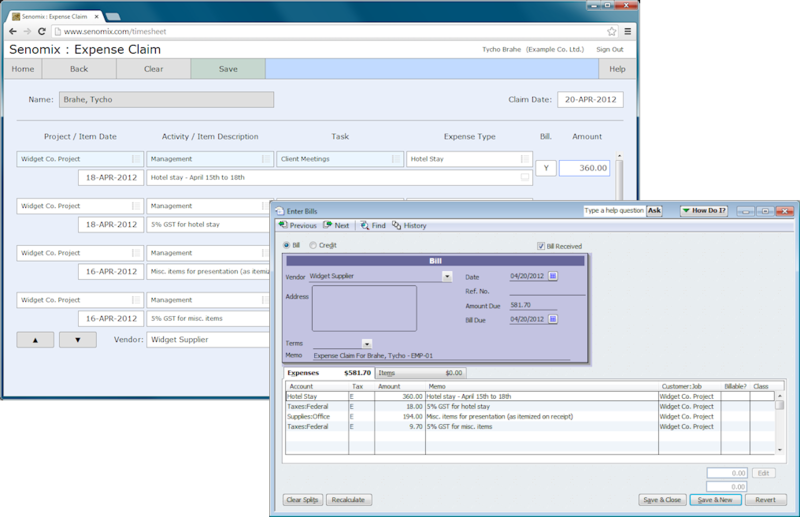 Whether managed directly or used as a front-end for your internal accounting process, Senomix Timesheets provides you with an easy way to record and track incurred project expenses.